Google's out with Android 4.0, a.k.a. Ice Cream Sandwich. Sounds delicious, but what exactly is it? Ice Cream Sandwich continues Google's tradition of alphabetical dessert naming. Froyo begat Gingerbread, Gingerbread begat Honeycomb, and together, Gingerbread and Honeycomb begat Ice Cream Sandwich. 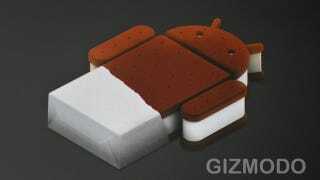 If you bought a high-end phone recently you will almost certainly be upgraded to Ice Cream Sandwich, and upcoming high-end devices will have it preloaded. For anyone who has used an Android phone, this is a pretty different look. It still has that famously customizable desktop, but it doesn't move in the same way. Open the app drawer and you scroll from side to side, not up and down as on Android 2.x. You have four customizable icons on your homescreen dock, and everything is just much smoother. Anything you want to do, you do with dynamic buttons on the screen; they reorient themselves depending on how your phone is tilted. Users can access each application's contextual options in the Action Bar (borrowed from Honeycomb) which is usually displayed at the top of the screen. This replaces Android's Menu and Search buttons entirely, but there's now a Recent Apps button for multitasking. Android's new and better-looking native font is called Roboto. It's designed for a very-pixel dense screen but doesn't try to look like something you'd find in an old book. It's pretty slick. All of the core Android apps have been revamped. The Contacts app is now called People, and it's much more fluid and intelligent, pulling information from more sources and integrating photos and social media. It's similar to the look of Windows Phone 7.5 (Mango), which is a good thing. Gmail has been vastly improved with off-line reading/search, swiping gestures to make scrolling through easier, and more intuitive addressing. The calendar lets you pinch-to-zoom—so you to start in a pulled-out view of your whole week and then fluidly zoom in on a particular appointment. ...and has a desktop class browser. You can have up to 16 tabs open at once. One of the annoyances of previous versions of Android was that they forced you view the mobile version of some sites even when you didn't want to (especially if you were on a tablet). In Ice Cream Sandwich you can flip to desktop mode with a single button-press and view the full page. At long last bookmarks can be synced with your Chrome web browser, and you can now save a page for offline reading, which is a great feature for travelers. They also promise greatly improved browser speeds over Android 2.3. You know what I hate about Gingerbread and Honeycomb? There's no simple way to close apps. They just keep running in the background and slowing down your system. With Ice Cream Sandwich, you can just open the visually-improved multi-tasking interface and simply swipe away apps you don't want to use. You can do the same to dismiss notifications, which now display more information and are vastly more customizable. You can even get them to display right on the lock screen. iOS borrowed notifications from Android and improved on them, now Android has borrowed those improvements. Ah, the circle of life. Beginning with Android 4.0, users can uninstall any application they want, even if they are native to Android. (If you love Opera Mini and hate Android's web browser, you can banish it.) Hopefully that includes the F#$%ing bloatware from carriers and manufacturers. We love this move. It also gives you improved monitoring of and control over your data usage. There is a built-in app that lets you analyze your data usage and even impose limitations on apps (such as how much data they can pull down in the background). You can also have it set an alarm if you're nearing your monthly data cap. This is a big plus as unlimited plans go the way of the dodo. ...and has NFC radio goodness. Ice Cream Sandwich has a built-in support for near field communication (NFC) radios. This will play a large role in the burgeoning mobile payments space (like Google Wallet), but it can also be used for more commonplace jobs. The new Android Beam feature allows users to share information by touching their phones together, but it's not limited to contact info. If you have a map open on your phone, you can tap it on your friend's phone and the map will automatically open for him/her as well. It works with games and other things, too. The APIs are out there, so developers will likely make a lot of magic with it. Even the most die-hard of Android users will probably admit that Android has never been beautiful. Maaaybe if you really loved Tron you thought Honeycomb was, but you were a small minority. Something is different here. They have actually given a ton of thought to design, and it really shows. Applications are not only more consistent in their look (so far), but they are way easier on the eyes. Also 1280x720 pixels (which is a 16:9 radio) is the native resolution of Ice Cream Sandwich, which means this OS was made for HD. Not an approximation of HD, but real HD. ...and it merges the phone and tablet operating systems. They didn't say this at the official announcement in Hong Kong, but Ice Cream Sandwich was designed to merge Android's phone OS (2.x, Gingerbread, Froyo, etc.) with Android's tablet OS (Android 3.x, Honeycomb). It looks much more like an improved Honeycomb than anything else, so while there was no announcement tonight that said it would be coming soon to tablets, we know that that's why Ice Cream Sandwich was created. It's a sandwich, which by definition brings things together to make something new and better. We're 99.99-percent sure we'll be seeing a manufacturer (likely Motorola with its rumored Xoom 2) announce ICS on a tablet in the very, very near future. Update: The Android developer page has a ton of info about Android 4.0 and there is repeated mention of tablets, devices with difference screen sizes, and "more" (which I'm hoping means Google TV). There are more bells and whistles than we could possibly get to, but highlights include built-in screen capturing throughout the OS. The notification panel has built-in music player controls. They keyboard has improved accuracy, better predictive text, and an inline spell-checker. Improved voice recognition, too, which I'd like to see in a head-to-head contest with iOS's Siri. Oh, and you can supposedly unlock your phone with your face. Yep, your face, using facial recognition on the front-facing camera (though we have yet to see that actually work). You can also warp your face in realtime while video chatting. More? Okay. Even the blind can use it! It has a new "Explore-by-touch" mode that lets users navigate without having to see the screen. ICS will gives those users audible feedback and even reads webpages to them. That's pretty impressive. It also has some beefy lock-screen controls that will let you manage notifications, control music, or shortcut you right into the app of your choice. A new visual voicemail app integrates messages and voice transcriptions and can integrate with third-party applications (coughGoogleVoice?cough). And you can snap a photo while shooting video. There's simply a ton in here, and it's almost certainly Android's most significant upgrade to date. You're caught up on Ice Cream Sandwich!. Now you can check out what's going on with the first phone that has it, Samsung's Galaxy Nexus.